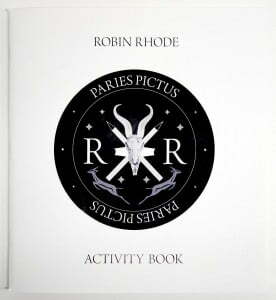 Robin Rhode’s Paries Pictus: Activity Book supplements the site specific wall drawing intervention of the same title on view at Lehmann Maupin’s 201 Chrystie Street space from January 10 – March 16, 2013. For this exhibition, Rhode applied twenty-one vinyl graphics to the gallery walls and invited a group of first graders to participate in an educational wall drawing experience. Working closely with groups of two, Rhode instructed the children to color in the geometric designs using the oversized oil pastels and graphite crayons included in the exhibition. Many of Rhode’s geometric shapes and activities from the exhibition, such as Connect the Dots, are replicated in the Paries Pictus Activity Book for art enthusiasts of all ages to enjoy.